This article is about the Accra Metropolitan Area, which serves as the capital of Ghana. For the metropolitan district, which serves as the administrative boundaries of the City of Accra, see Accra Metropolitan District. Accra /əˈkrɑː/ is the capital and largest city of Ghana, covering an area of 225.67 km2 (87.13 sq mi) with an estimated urban population of 2.27 million as of 2012[update]. It is organized into 10 local government districts – 9 municipal districts and the Accra Metropolitan District, which is the only district within the capital to be granted city status. "Accra" usually refers to the Accra Metropolitan Area, which serves as the capital of Ghana, while the district within the jurisdiction of the Accra Metropolitan Assembly is distinguished from the rest of the capital as the "City of Accra". In common usage, however, the terms "Accra" and "City of Accra" are used interchangeably. The intersection of the Lafa stream and Mallam junction serves as the western border of Accra, the Great Hall of the University of Ghana forms Accra's northern border, while the Nautical College forms the eastern border. The Gulf of Guinea forms the southern border. Formed from the merger of distinct settlements around British Fort James, Dutch Fort Crêvecoeur (Ussher Fort), and Danish Fort Christiansborg as Jamestown, Usshertown, and Christiansborg respectively, Accra served as the capital of the British Gold Coast between 1877 and 1957 and has since transitioned into a modern metropolis. The capital's architecture reflects this history, ranging from 19th-century colonial architecture to modern skyscrapers and apartment blocks. Accra is the Greater Accra Region's economic and administrative hub, and serves as the anchor of the larger Greater Accra Metropolitan Area (GAMA), which is inhabited by about 4 million people, making it the thirteenth-largest metropolitan area in Africa. Strategic initiatives, such as transportation, are coordinated between the local government authorities, while the Accra Metropolitan Assembly, based in West Ridge, is responsible for the administration of the 60 km2 (23 sq mi) City of Accra only. The central business district of Accra contains the city's main banks and department stores, as well as an area known as the Ministries, where Ghana's government administration is concentrated. Economic activities in Accra include the financial and commercial sectors, fishing and the manufacture of processed food, lumber, plywood, textiles, clothing and chemicals. Tourism is becoming a thriving source of business for those in arts and crafts, historical sites and local travel and tour agents. The Oxford Street in the district of Osu has grown to become the hub of business and night life in Accra. In 2010, the Globalization and World Cities Research Network think tank designated Accra as a Gamma level world city, indicating a growing level of international influence and connectedness. The word Accra is derived from the Akan word Nkran meaning "ants", a reference to the numerous anthills seen in the countryside around Accra. The name specifically refers to soldier ants, and was applied to both the town and people by the Twi speakers. The name of Accra in the Ga language is Ga or Gaga, the same name as that of the Ga people and a cognate with Nkran. The word is sometimes rendered with the nasalised vowels as Gã or Gãgã. Historian Carl Christian Reindorf confirmed this etymology, proposing a link between the martial qualities and migratory behaviour of the local ants and those of the Ga people. The link between the ethonym and ants was explicitly reflected in the recognition of anthills as sacred places. Often ringed by sacred fences (aklabatsa), the tall red mounds dotting Accra's hinterland were seen as microcosms of human community and as nodal points between the known world and the world of the dead. While the Ga used the reference to the invasive species of dark-brown swarming ants to connote military prowess and their ancient conquest of Guang speakers residing in the Accra Plains, the Akan-speaking appropriation and translation of this metaphor had a less than generous meaning. Instead of viewing Ga speakers as a formidable military force, the Akan-speaking term "Nkran" cast Ga peoples as pests or nuisances to be controlled or exterminated. The name Ga is actually a cognate of the name Akan, one of a few words in which [g] corresponds to [k] in Akan. Ga also gave its name to the Ga districts surrounding Accra. The name Accra was given to Nkran by Europeans. An earlier spelling used by the Danes was Akra. The main Ga group known as the Tumgwa We led by Ayi Kushie arrived by sea. When the Guan (Lartehs) on the coast saw them on their canoes at sea, they looked like ants. Hence, the Lartehs refer to them as Nkran (ants). Nkran was later corrupted by the Danes to Akra, then to present-day Accra. Nkran in the Ga language is Gaga, thus they also started calling themselves Ga. Due to their sheer numbers, the indigenous Lartehs thus relocated to the Akuapem ridge. The Ga are also part of the main Guan group that started the initial migration from the Nubia Empire. Initially, Accra was not the most prominent trading centre; the trade hubs of the time were the ports at Ada and Prampram, along with the inland centres of Dodowa and Akuse. The Dutch built the nearby outposts of Ussher Fort while the British and the Swedes built James Fort and Christiansborg castles, respectively. By the 17th century, Portugal, France and Denmark, had constructed forts in the city. Britain gradually acquired the interests of all other countries beginning in 1851, when Denmark sold Christiansborg (which they had acquired from the Swedes) and their other forts to the British. The Netherlands was the last to sell out, in 1871. In 1873, after decades of tension between the British and Ashantis, the British attacked and virtually destroyed Kumasi. The British then captured Accra in 1874, and in 1877, at the end of the second Anglo-Asante War, Accra replaced Cape Coast as the capital of the British Gold Coast. This decision was made because Accra had a drier climate relative to Cape Coast. Until this time, the settlement of Accra was confined between Ussher Fort to the east and the Korle Lagoon to the west. 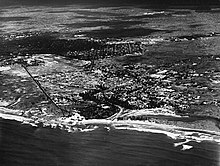 As the newly established Gold Coast's administrative functions were moved to Accra (1877), an influx of British colonial administrator and settlers grew around the Christiansborg (modern Osu, Ministries, Ridge, Labone, and Cantonments) began, and the city began to expand to accommodate the new residents. Victoriaborg was formed in the late 19th century as an exclusively European residential neighbourhood, located to the east of the city limits of the time. The boundaries of Accra were further stretched in 1908. This expansion entailed the creation of a native-only neighbourhood, intended to accommodate members of the native population as a means of relieving congestion problems in the overcrowded city centre. Adabraka was thus established to the north of the city. One of the most influential decisions in the history of the city was that of building the Accra-Kumasi railway in 1908. This was to connect Accra, the country's foremost port at that time, with Ghana's main cocoa-producing regions. In 1923, the railway was completed, and by 1924, cocoa was Ghana's largest export. The British Gold Coast heavily influenced the shape that Accra during this period. For example, racial segregation of neighbourhoods was mandated by law until 1923, and all new buildings were required to be built out of stone or concrete. Despite these regulations, British settlers of the Gold Coast were very hesitant to invest any large amount of money into the city to maintain its infrastructure or improve public works. This did not change until the governorship of Sir Frederick Gordon Guggisberg during which period the three separate settlements (Osu, La and Jamestown) merged to become modern Accra. Guggisberg's administration laid out the present grid networked neighborhoods of Tudu, Adabraka and Asylum Down. Among the achievements of Guggisberg was the building of a bridge across the Korle Lagoon in 1923, which opened the land west of the lagoon for settlement. Guggisberg also oversaw the building of a major hospital (Korle-Bu) and secondary school (Achimota). Such improvements led to an increase in Accra's population due to the migration of rural dwellers into the city, and the immigration of increasing numbers of British businessmen and administrators. In the years following World War II, the neighbourhoods of Ridge and Cantonments were planned as low-density developments for Europeans, while many rural migrants settled in neighbourhoods which had not yet been incorporated into Accra's municipal boundary, such as Nima and surrounding areas. Thus, the development of these neighbourhoods was unregulated by the government, creating a crowded and jumbled shanty-town landscape. Another area of Accra that took shape at this time was the central business district (CBD). More administrative buildings were built on High Street, forming a massive judicial/administrative complex. Additionally, the expansion of the economy led to many more commercial buildings being built in the CBD. In 1944, Accra's city planner Maxwell Fry devised a town plan, which was revised in 1958 by B.D.W. Treavallion and Alan Flood. Although the Fry/Trevallion plan was never followed through, it illustrated the British vision of how Accra should develop. In the Fry/Treavallion plan, a reorganisation of the CBD was called for, as well as the development of the coastal region of the city. To reorganise the CBD, the planners decided to superimpose a tight street grid north of Fort Ussher. To the east of this newly organised CBD, the planners hoped to preserve a broad, open space for a restaurant, country club, and polo and cricket fields. Additionally, the British planners intended to build large numbers of public squares, fountains, and ornamental pools and statues throughout the city, as well as a vast Parliament Complex in the city centre. Lastly, the Fry/Treavallion plan included plans to make the coastal region an extension of the exclusive European neighbourhood of Victoriaborg, and to create a recreational preserve for the elite. However, the British Gold Coast ended before the Fry/Treavallion plan was enacted. When Kwame Nkrumah became Ghana's first postindependence Prime Minister in 1957, he created his own plan for Accra's development. Instead of creating spaces to serve the elite, Nkrumah sought to create spaces to inspire pride and nationalism in his people and people throughout Africa. Rather than creating ornamental fountains and a large Parliament complex, Nkrumah decided to build landmarks such as Independence Square, the State House, and the Organisation of African Unity building, and to refurbish Christianborg Castle. Nkrumah decided to leave the Atlantic coastal region undeveloped, so as to not detract attention from the Community Centre or Independence Square, lending both spaces symbolic significance. The Nkrumah plan did not emphasise order nearly as much as the Fry/Treavallion plan did; whereas the British plan strove to lessen crowding in the commercial district and help relieve the overcrowding of neighbourhoods bordering the CBD, the Nkrumah plan allowed for continued compression of commercial establishments into the CBD, as well as increased migration into Jamestown. The modern city is centred on the original British, Danish, and Dutch forts and their surrounding communities: Jamestown near the British James Fort, Osu near the Danish fort of Christiansborg (now Osu Castle), and Ussherstown near the Dutch Ussher fort. Tourist attractions include the National Museum of Ghana, the Ghana Academy of Arts and Sciences, the National Archives of Ghana and Ghana's central library, the National Theatre, the Accra Centre for National Culture, and the Jamestown Lighthouse. 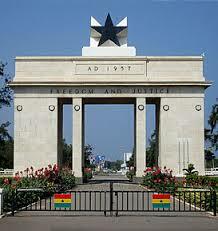 The Parliament, Supreme Court of Ghana, Black Star Square and the Bank of Ghana is also located in Accra. The city is also a transportation hub, home to the Kotoka International Airport, and railway links to Tema, Sekondi-Takoradi and Kumasi. Accra has become a location for national and international business conferences, such as the BarCamp Ghana series, organised by GhanaThink Foundation. Owing to its location in the Dahomey Gap, where the coast runs parallel to the prevailing moist monsoonal winds, Accra features a tropical savanna climate (Köppen climate classification Aw) that borders on a hot semi-arid climate (BSh). The average annual rainfall is about 730 mm, which falls primarily during Ghana's two rainy seasons. The chief rainy season begins in April and ends in mid-July, whilst a weaker second rainy season occurs in October. Rain usually falls in short intensive storms and causes local flooding in which drainage channels are obstructed. Very little variation in temperature occurs throughout the year. The mean monthly temperature ranges from 25.9 °C (78.6 °F) in August (the coolest) to 29.6 °C (85.3 °F) in March (the hottest), with an annual average of 27.6 °C (81.7 °F). The "cooler" months tend to be more humid than the warmer months. As a result, during the warmer months and particularly during the windy harmattan season, the city experiences a breezy "dry heat" that feels less warm than the "cooler" but more humid rainy season. As a coastal city, Accra is vulnerable to the impacts of climate change and sea level rise, with population growth putting increasing pressure on the coastal areas. Drainage infrastructure is particularly at risk, which has profound implications for people's livelihoods, especially in informal settlements. Inadequate planning regulation and law enforcement, as well as perceived corruption in government processes, lack of communication across government departments and lack of concern or government co-ordination with respect to building codes are major impediments to progressing the development of Accra's drainage infrastructure, according to the Climate & Development Knowledge Network. As Accra is close to the equator, the daylight hours are practically uniform during the year. Relative humidity is generally high, varying from 65% in the midafternoon to 95% at night. The predominant wind direction in Accra is from the WSW to NNE sectors. Wind speeds normally range between 8 and 16 km/h. High wind gusts occur with thunderstorms, which generally pass in squalls along the coast. The maximum wind speed record in Accra is 107.4 km/h (58 knots). Strong winds associated with thunderstorm activity often cause damage to property by removing roofing material. Several areas of Accra experience microclimatic effects. Low-profile drainage basins with a north-south orientation are not as well ventilated as those oriented east-west. Air is often trapped in pockets over the city, and an insulation effect can give rise to a local increase in air temperature of several degrees. This occurs most notably in the Accra Newtown sports complex areas. The administration of Accra occurs at two levels. Strategic initiatives, such as the urban transportation project, are coordinated between district authorities, while local administration is carried out by local government authorities, which are responsible for most local services, such as local planning, local roads and refuse collection within their area of jurisdiction. Accra spans 10 separate local government districts. The City of Accra, coterminous with the Accra Metropolitan District, once comprised the entirety of Accra until the Ledzokuku, Krowor, La-Dadekotopon, Ablekuma North, Ablekuma West, Ayawaso East, Ayawaso North, Ayawaso West, and Okaikwei North districts were carved out as separate municipal districts. 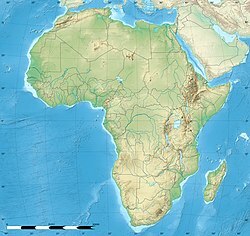 Accra covers an area of 225.67 km2 (87.13 sq mi), of which the City of Accra covers 60 km2 (23 sq mi). The Accra Metropolitan Assembly, which governs the City of Accra within the boundaries of the Accra Metropolitan District, is led by a District Chief Executive who is appointed by the President of the Republic of Ghana. The current Mayor of Accra is Mohammed Adjei Sowah, who was appointed by President Nana Akufo-Addo and approved unanimously by the AMA on 23 March 2017. To promote efficiency in the administrative machinery and also meet the ever pressing demands for amenities and essential services, the City of Accra is currently divided into the Ablekuma Central, Ablekuma South, Ashiedu Keteke, Ayawaso Central, Okaikoi South, and Osu Klottey sub-metropolitan districts. The Ring Road, extending from the Korle Lagoon in the west, north to Kwame Nkrumah Circle, following east to the juncture of Independence Avenue, and continuing on to Osu, forms a ring around the oldest districts of Accra, and separates central Accra from the outlying suburbs. Central Accra includes the CBD, which consists of the historic districts of Usshertown, Tudu, Victoriaborg, West Ridge, and East Ridge, as well as the historic residential districts of Jamestown, Adabraka, Asylum Down, North Ridge and Christiansborg/Osu. Although satellite business districts such as the Airport City have been established across the city, Central Accra remains the administrative and cultural centre of Accra, hosting government ministries, hotels, businesses, and financial institutions. Central Accra's principal attractions include the Kwame Nkrumah Mausoleum, the National Museum, Independence Square, the National Theatre, and the Ohene Djan Stadium. Northern Accra is a residential and business district. The area contains the "37" Military Hospital, The Flagstaff House, several foreign embassies, Achimota School, Achimota Golf Park, and the University of Ghana's Legon campus, which serves as Accra's northern boundary. Eastern Accra is largely residential and geographically north of Ring Road East, stretching as far north as Kwame Nkrumah Motorway; the district is bordered to the west by Liberation Road. Western Accra is largely a residential and business area. Whilst geographically less expansive than the northern and eastern reaches of the city as a result of the large saltponds of Tettegu and Aplaku, it nonetheless boasts one of Accra's most important landmarks, the Korle Bu Teaching Hospital. Geographically, the areas west of Ring Road West, extending as far west as the saltponds and south of Graphic Road, are considered Accra West. The period between 1960 and 1970 saw rapid industrialisation and expansion in Accra's manufacturing and commercial sectors. This contributed to high rural-urban migration to the city, and consequently a high population growth rate. The stagnation of the Ghanaian economy during the 1970s slowed the growth of Accra's population, as shown by the falling growth rate of the 1970–1984 intercensal years. Later, however, the decline in agriculture in rural communities in Ghana and rising industrialisation in urban regions, coupled with the late-1980s boom in the service sector, once again propelled immigration to Accra. The primacy of the Accra Metropolitan Area as the Greater Accra region's administrative, educational, industrial and commercial centre continues to be the major force for its population growth, with immigration contributing to over 35% of the Accra's population growth. The gross density of population for the Accra Metropolitan Area in 2000 was 10.03 persons per hectare, compared to 6.23 per hectare in 1970. The highest densities were recorded in the Accra Metropolitan Assembly, with an overall average of 69.3 persons per hectare. At the community level, densities exceeding 250 persons per hectare occurred mostly in the immigrant and depressed areas in the oldest parts of Accra, such as Accra New Town, Nima, Jamestown and Usshertown. In higher-income areas, densities ranged between 17.5 and 40 persons per hectare. Accra's population is a very youthful one, with 56% of the population being under 24 years of age. This predominance of young people is not expected to decline in the foreseeable future. Fifty-one percent (51%) of the population are females, and the remaining 49% males. This gives a males-to-females ratio of 1:1.04. The greater number of females is a reflection of the nationwide trend, where the estimated ratio of males to females is 1:1.03. Decentralisation is expected to reduce the migration rates in Accra. An assessment of the extent of migration to Accra, based on present locality and gender, reveals that 45% of residents in Accra are African immigrants from countries across the African continent. Parts of Central Accra comprise a mixture of very low-density development with under-used service infrastructure on the one hand, high-density development and overstretched infrastructure services on the other. The growth of Accra has led to the neglect of some of the old settlements, whilst efforts are being made to provide the newly developing suburban areas with services and infrastructure to cater for the needs of the middle-income earners. Peripheral residential development in Accra barely has sufficient infrastructure to support it. There are also large numbers of uncompleted houses, interspersed with pockets of undeveloped land, which are often subject of litigation, due to the inability of organisations and individuals who own them to complete or develop them due to lack of funds. Housing can be grouped into three broad categories: the low-income, middle-income and high-income areas. The low-income housing areas comprise Osu, Jamestown, Adedenkpo, Chorkor, La, Teshie, Nungua, Sukura, Kwashieman, Odorkor, Bubiashie, Abeka, Nima, Maamobi and Chorkor. Altogether, these areas accommodate about 58% of Accra's total population. Most of Accra's informal businesses are located in low-income areas. Almost all low-income areas are built up with little room for expansion. This is particularly so in the areas of the inner city. The middle-income areas of Accra are predominantly populated by Ghanaian citizens and business, administrative and professional families. Much of the housing in these areas has been provided by state, parastatal and private sector organisations and individuals. The middle-income areas include Dansoman Estates, North Kaneshie Estates, Asylum Down, Kanda Estates, Abelempke, Achimota, Adenta and Tesano. Usually, these areas, unlike the low-income areas, are planned developments, but are in need of infrastructure services. Building materials and general housing conditions are of better quality. The middle-income group comprises 32% of the city's population of which are Ghanaian citizens make up. The high-income areas provide housing for the remaining 10% of the population of which Ghanaian citizens also make up. They include areas like North Ridge and West Ridge, Ringway Estates, north Labone Estates, Airport Residential Area, Roman Ridge, East Legon. These areas are all planned and have well developed infrastructure with spacious and landscaped ground in sharp contrast with, particularly, the low-income areas. Buildings are usually built with sandcrete blocks, and have walls and roofed with aluminium, or asbestos roofing sheets. There are also high-income peripheral areas like Haatso, Kwabenya, Pokuase, Adenta, Taifa, Mallam, where development of engineering infrastructure is not yet complete. These areas developed ahead of infrastructure, however the Achimota-Ofankor controlled-access highway was scheduled to open in May 2012,[needs update] and the Awoshie-Pokuase[dead link] dual carriageway road construction was also due to be completed in 2012. [needs update] In total, 84.4% of all houses in the Accra Metropolitan Area have their outside walls made up of cement. Similarly, houses found within Accra have 99.2% of their floor materials made up of cement. In 2008, the World Bank estimated that Accra's economy only constituted around US$3 billion of Ghana's total gross domestic product (GDP). The economically active population of Accra is estimated to be 823,327. Accra is a centre for manufacturing, marketing, finance, insurance, and transportation. Its financial sector incorporates a central bank, nine commercial banks (with 81 branches), four development banks (with 19 branches), four merchant banks (with seven branches), three discount houses, one home finance mortgage bank, multiple building societies, Ghana Stock Exchange (GSE), foreign exchange bureauxs, finance houses, insurance companies, insurance brokerage firms, two savings and loans companies, and numerous real estate developers, with industrial sites and residential developments. The road network in the Accra Metropolitan Area totals 1,117 kilometres (694 mi) in length. There are over 50,506 identified residential properties in Accra, and about 4,054 commercial/industrial/mixed properties, with a total rateable value of GH¢13,849,014. There are also supermarkets, 36 facilities for both on–street and off-street parking, and shopping malls, as well as several facilities for sports and recreation. The sectors of Accra's economy consist of the primary, secondary (manufacturing, electricity, gas, water, construction) and tertiary sectors (supermarkets, shopping malls, hotel, restaurant, transportation, storage, communication, financial intermediation, real estate service, public administration, education, health and other social services). The tertiary service sector is the city's largest, employing about 531,670 people. The second-largest, the secondary sector, employs 22.34% of the labour force, or around 183,934 people. 12.2% of the city's workforce are reportedly unemployed, totalling around 114,198 people. Licensed and Commercial fishing vessels off the coast of Accra. Accra's smallest economic sector, the primary sector, employs approximately 91,556 people. The predominant economic activities are fishery and urban agriculture, with fishery accounting for 78% of production labour. Urban agriculture in Accra centres on the growth of vegetables, several crops and poultry. The fishery industry is the most important sub-sector, with 10% of the catch being exported and the rest consumed locally. The industry is characterised by extreme seasonableness, operating primarily between June and September. Although most deep-water Atlantic fishing around Accra takes place in the June–September period, fishery operations take place close to the shore throughout the year, and there are clear indications of the depletion of fish stocks in the near future. Fishing operations are most prominent at the Jamestown, La, Teshie, Nungua and Chorkor fishing shores. Pre-school comprises nursery and kindergarten. In 2001, there were 7,923 children (3,893 girls and 4,030 boys) in pre-schools in Accra. In 2010, the enrolment rate at Pre-school was 98%. Pre-schools are regulated by the Ministry of Employment and Social Welfare, and are mostly privately owned and operated. In 2001, there were 62 government-owned pre-schools in the Accra metropolis. Primary school enrolment of girls is higher than that of boys. In 2010, the enrollment rate at primary school level was 95%. The Junior High School is part of Ghana's basic education program. Its nationwide implementation began on 29 September 1987. In the 2001/2002 academic year, 61,080 pupils had enrolled in Accra, representing 57.17% of the 129,467 school-age 12–to-14-year-olds. In 2010, the enrolment rate at Junior high school level was 95%. The ratio of girls is also higher at this level. The transition rate between junior high and senior high school increased from 30 per cent in 1990 to 50 per cent in 2001. The number of students grew by 23,102 between 1990 and 2005, an increase of about 2,310 a year, since 2010 the senior high school enrolment rate has been 95%. Ghana International School (GIS), a private non-profit A-Level school founded in 1955 for children from ages 3–18, is located in Accra's Cantonments. Abelemkpe is the home of Lincoln Community School, a private, non-profit International Baccalaureate (IB) school for students aged 3–18, established in 1968. The American International School is also situated in Accra. A number of notable public secondary schools lie on the outskirts of Accra: Achimota Senior High School, commonly referred to as "Motown", which was founded in 1924 and opened in 1927; the Accra Academy ranked in top ten high schools in Africa, known as "Accra Aca"; the Presbyterian Boys' Secondary School in Legon,commonly known as "Presec"; Wesley Grammar School – WESS-G Dansoman, St. Mary's Senior High School commonly referred to as "Merriez"- is a well-known girls' boarding school in Ghana; St. Thomas Aquinas Senior High School, commonly known as "Quinas"; Accra High School commonly known as ("Ahisco");, West Africa Secondary School, commonly known as "WASS"; the Accra Girls' Senior High School, commonly known as "Agiss";Kaneshie Secondary Technical School ("Kateco"); the Armed Forces Secondary Technical; and St. John's Grammar School; among others. The University of Ghana is located 13 kilometres (8.1 mi) north of the city centre at Legon. A number of other public and private universities and tertiary institutions have since been founded in Accra, some of which are listed below. See List of hospitals in the Greater Accra Region. Transportation by means of road is the major form of transportation in Accra. The rail system is not effective and patronised by only a few. It is not common to see trains in town. Recently, plans have been afoot to develop a more advanced rapid transit bus system for the city and its metropolitan area. This project is aimed at creating an "integrated, efficient, cost-effective and sustainable transportation system responsive to the needs of society, and supporting growth". In 2003, the Metro Mass Transit Service, was inaugurated in Accra as a more comfortable and cheaper alternative to the trotro. The country's first Bus Rapid Transit system is also planned for the city, with the first phase to commence by the end of 2015. Accra is connected by railway line to Kumasi and Takoradi. There is a suburban railway line between Accra and Tema. Accra is served by Kotoka International Airport, which has both civil and military uses. Located 6 miles (9.7 kilometres) from downtown Accra, the airport handles all of the city's scheduled passenger services. There are plans to build a second airport to relieve the aviation pressure on the Kotoka International Airport. This new airport will be located at Prampram in Accra and will be constructed by China Airport Civil Construction. Accra has an extensive taxi network and numerous taxi ranks, but most taxis lack a meter system, so price negotiation is required between the passenger and driver. Metered taxis do operate in the city, but tend to be more expensive. Taxis in Ghana are painted in two colours: the four bumpers fenders are yellow/orange, and the rest of the car is in a colour of the operator's choice. By far the most common form of transport in Accra, tro tros (motor vehicles re-purposed for passenger transport) is the third biggest, and second most efficient and cost-effective way of getting around the city. The buses are typically minibuses or vans, with the most popular being Nissan Urvan 15-seaters and Mercedes Benz Sprinter or D 309 vans. Trotros are typically decorated with flags and stickers of various countries or (local and international) soccer teams, and with witty sayings, wisecracks, local proverbs (in English or local languages) or Bible verses printed on the bus's rear. Trotros stop at any bus stop or gathering of people, and can also be found at truck and taxi stations, such as the Neoplan station. Football is the most popular sport in Accra. The most famous football club in the city is Accra Hearts of Oak, whose main rivals are Asante Kotoko of Kumasi. The Accra Sports Stadium is home to the Hearts of Oak, and a host venue of the Black Stars, the national football team of Ghana. In 2008, the Accra Sports Stadium hosted 9 matches in the 2008 African Cup of Nations. Another notable club is Accra Lions FC, which also plays in the Accra Sports Stadium. Accra is home to the Right to Dream Academy, which gives young Ghanaians a chance at a career in professional football. Many of the academy's alumni, including Chicago Fire's David Accam, Helsingborg's Ema Boateng, Halmstad's King Gyan and Manchester City's Godsway Donyoh and Enock Kwakwa, as well as Ghanaian national team players, Brimah Razak, Harrison Afful, John Boye, Jonathan Mensah, Mohamed Awal, Yaw Frimpong, Mohammed Rabiu, Paul de Vries, Seidu Bancey, Mahatma Otoo, Asamoah Gyan, Latif Mohammed, Yahaya Mohamed, Theophilus Annorbaah, Michael Essien, Yussif Raman Chibsah, Kwadwo Asamoah, Joshua Otoo, Nuru Sulley, David Addy, Jerry Akaminko, Daniel Opare and Foli Adade, were also born in Accra. Boxing is also popular, with many former world champions coming out of Ghana, including Azumah Nelson, Joshua Clottey, and Ike Quartey. Accra will host the 2023 African Games. Tourism in Ghana accounted for 1,087,000 international tourist arrivals in 2011. Accra is the Greater Accra region's tourist hub, sporting a wide variety of hotels, monuments, museums and nightclubs. The city has three five-star hotels: the Labadi Beach Hotel, the La Palm Royal Beach Hotel and the Movenpick Ambassador Hotel. The Golden Tulip Hotel and Novotel Accra, located in Accra's central business district, are both ranked four stars. There are numerous three-star hotels, including the Hotel Wangara, Hotel Shangri-La and Erata Hotel, as well as many budget hotels. The Accra International Conference Centre and other meeting facilities provide venues for conference tourism. The Du Bois Centre houses a research library and gallery of manuscripts, as well as the graves of its namesake, the scholar W.E.B. Du Bois, and his wife Shirley Graham Du Bois. The Kwame Nkrumah Mausoleum is the resting place of Ghana's first President, Kwame Nkrumah, who oversaw the Gold Coast's independence from Britain and was a leading exponent of Pan-Africanism. Accra furthermore hosts the National Museum, National Theatre, with its distinctive modern Chinese architecture. The city's foremost historical site is the Jamestown area, which contains the Ussher Fort and James Fort, and Osu Castle (also known as Christiansborg), built by Danish settlers in the 17th century. Other sites of note include the Jubilee House (the office of the Government of Ghana and the President of Ghana), the Parliament House of Ghana, the Ghana-India Kofi Annan Centre of Excellence in ICT, the Black Star Square, Accra Sports Stadium, and the Accra Centre for National Culture. The Cathedral of the Holy Spirit is the seat of the Roman Catholic Archdiocese of Accra, which was founded in 1943 as the Apostolic Prefecture of Accra. The cathedral itself dates to 1947. Accra has an Atlantic beachfront and the most popular of the city's beaches is Labadi Beach, along with Kokrobite Beach, which is located 25 kilometres (16 miles) west of Accra. The beachfront area also houses the Academy of African Music and Arts. ^ "Physical And Natural Environment Boundary/ Administrative Area". ama.gov.gh. Archived from the original on 5 July 2015. ^ "Boundary and Administrative Area". Ghanadistricts.com. Archived from the original on 11 July 2011. Retrieved 22 July 2010. ^ "Citypopulation.de". Thomas Brinkhoff. Archived from the original on 20 December 2016. Retrieved 25 April 2017. ^ "Ghana". The World Factbook. Central Intelligence Agency. Archived from the original on 15 November 2013. Retrieved 23 November 2013. ^ "Our Background – AMA". ama.gov.gh. Archived from the original on 10 January 2018. Retrieved 14 January 2018. ^ "Environmental and Structural Inequalities in Greater Accra". The Journal of the International Institute. Archived from the original on 19 October 2012. Retrieved 22 July 2010. ^ "The World According to GaWC 2010". Globalization and World Cities (GaWC) Study Group and Network. Loughborough University. Archived from the original on 24 September 2011. Retrieved 15 September 2011. ^ Akuamoa, Geoffrey. "The Gas". KWAME, THE LAST SLAVE FROM WEST AFRICA. Lulu.com. ISBN 978-1-291-35746-2. ^ a b Parker, John (1 January 2000). Making the Town: Ga State and Society in Early Colonial Accra. ABC-CLIO, LLC. p. 6. ISBN 978-0-325-00190-6. ^ Inc, Encyclopaedia Britannica (1 April 2012). Views of Africa. Encyclopaedia Britannica, Inc. p. 12. ISBN 978-1-61535-571-6. ^ Rucker, Walter C. (28 September 2015). Gold Coast Diasporas: Identity, Culture, and Power. Indiana University Press. p. 30. ISBN 978-0-253-01701-7. ^ Dakubu, Mary Esther Kropp (1 January 1997). Korle Meets the Sea: A Sociolinguistic History of Accra. Oxford University Press. p. 113. ISBN 978-0-19-506061-4. ^ a b Ntiamoah, Eric Maclean (1 January 2008). The City of Accra – A Pictorial Visit. AuthorHouse. p. 4. ISBN 978-1-4343-5860-8. ^ Harries, Patrick; Maxwell, David (20 July 2012). The Spiritual in the Secular: Missionaries and Knowledge about Africa. Wm. B. Eerdmans Publishing. p. 73. ISBN 978-0-8028-6634-9. ^ Jenkins, Paul (1 January 1998). The Recovery of the West African Past: African Pastors and African History in the Nineteenth Century : C.C. Reindorf & Samuel Johnson : Papers from an International Seminar Held in Basel, Switzerland, 25-28th October 1995 to Celebrate the Centenary of the Publication of C.C. Reindorf's History of the Gold Coast and Asante. Basler Afrika Bibliographien. p. 86. ISBN 978-3-905141-70-2. ^ "The Larteh Story". Akuapem Organisation. Archived from the original on 11 August 2015. Retrieved 6 July 2015. ^ "History of Accra". The African Executive. Archived from the original on 7 July 2011. Retrieved 22 July 2010. ^ "History of Accra". Retrieved 17 February 2011. ^ "Average Conditions Accra, Ghana". BBC Weather. May 2011. Archived from the original on 21 October 2006. Retrieved 9 September 2009. ^ "World Weather Information Service – Accra". World Meteorological Organization. Archived from the original on 18 October 2016. Retrieved 17 October 2016. ^ "Klimatafel von Accra (Int. Flugh.) / Ghana" (PDF). Baseline climate means (1961–1990) from stations all over the world (in German). Deutscher Wetterdienst. Retrieved 17 October 2016. ^ "Programmes & Projects – MLGRD". mlgrd.gov.gh. Archived from the original on 22 October 2017. Retrieved 22 October 2017. ^ Adjei, Jonathan (23 March 2017). "Akufo-Addo's nominee, Adjei Sowah secures full endorsement as Accra Mayor". Kasapa fm online. Archived from the original on 6 August 2017. Retrieved 6 August 2017. ^ Accra Metropolitan Assembly, Boundary and Administrative Area Archived 2 November 2010 at the Wayback Machine. Retrieved 1 July 2009. ^ "A repository of all districts in the republic of Ghana". Ghana Districts. Archived from the original on 11 July 2011. Retrieved 5 August 2010. ^ "Achimota-Ofankor Road To Open To Traffic in May". graphic.com.gh. Daily Graphic. 14 March 2012. Archived from the original on 12 May 2016. Retrieved 22 April 2016 – via Modern Ghana. ^ "Ghana: Awoshie-Pokuase Road Projet" (PDF). afdb.org. Archived (PDF) from the original on 23 July 2013. ^ http://www.worldbank.org/afr/wps/wp110.pdf Archived 12 February 2011 at the Wayback Machine World Bank Africa Region Working Paper Series 110 (PDF). Retrieved 15 October 2011. ^ "Mantse Ankrah the Accra landlord is coming". Ghana Business Media. January 2012. Archived from the original on 23 July 2013. ^ Oil Revenue Archived 3 August 2012 at the Wayback Machine. ghanaoilwatch.org. ^ a b "A repository of all districts in the republic of Ghana". Ghana Districts. Archived from the original on 11 July 2011. Retrieved 5 August 2010. ^ a b c d e f "UNICEF at a glance: Ghana – Statistics". unicef.org. UNICEF. Archived from the original on 3 April 2012. Retrieved 5 April 2012. ^ "Lincoln Community School". School Website. Archived from the original on 26 September 2009. Retrieved 29 October 2009. ^ "Achimota School Website". Achimota School. Archived from the original on 23 September 2009. Retrieved 29 October 2009. ^ "US$95m Voted to Solve Accra, Kumasi Transport Problems | ModernGhana.com News". Modernghana.com. Archived from the original on 7 April 2012. Retrieved 5 August 2010. ^ Urban Transport Project Archived 17 February 2012 at the Wayback Machine. utp-ghana.com. Retrieved 5 August 2010. ^ "Accra-Tema Railway Line". railway-technology.com. Kable Intelligence. c. 2010. Archived from the original on 23 December 2017. Retrieved 23 December 2017. ^ "Kotoka International Airport". World Aero Data. 2009. Archived from the original on 12 June 2008. Retrieved 29 October 2009. ^ "Transportation | Ghana, Accra, Transport, Car, Trotros". Beautiful Ghana. 1 May 2006. Archived from the original on 21 June 2010. Retrieved 5 August 2010. ^ "Accra Hearts of Oak Sporting Club". Official website. Accra Hearts of Oak. Archived from the original on 9 December 2009. Retrieved 31 October 2009. ^ "Accra Lions FC opts for Accra Sports Stadium as home ground for Division One League campaign". Ghanasoccernet. Retrieved 19 July 2018. ^ "Ghana To Earn 8.3 Billion USD From Tourism By 2027". ghanaonlinenews.com. 3 April 2014. Archived from the original on 14 August 2016. Retrieved 3 June 2014. ^ Touring Ghana – Greater Accra Region Archived 11 April 2012 at the Wayback Machine. touringghana.com. ^ a b "SCI: Sister City Directory". Sister-cities.org. Archived from the original on 31 August 2010. Retrieved 5 August 2010. ^ "Johannesburg's Sister Cities". joburg.org.za. Archived from the original on 1 February 2014. Retrieved 14 February 2014. ^ "DC Sister Cities". os.dc.gov. Archived from the original on 2 July 2017. Retrieved 8 August 2017. ^ "Columbia's Sister Cities". columbiawac.org. Archived from the original on 8 September 2013. Retrieved 14 February 2014.